When GM went through bankruptcy there was a reshuffling of manufacturing throughout the company and all of its divisions. Part of the fallout of the failure of the old GM was that the Pontiac Michigan plant would no longer be manufacturing heavy duty trucks. GM planned to send that work to its Fort Wayne Indiana plant. The folks working at that plant were relieved and excited because it meant that their jobs would be locked in. However, there was one problem. The trucks were too large to fit the assembly line. 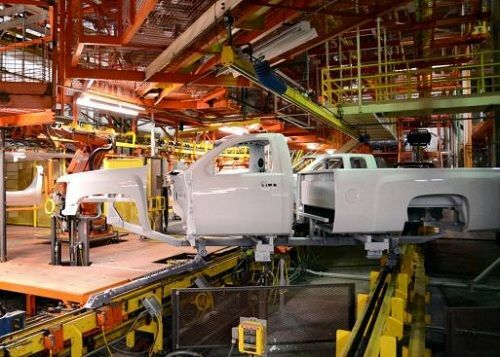 The main problem was that the paint shop conveyor and carrier was not large enough to handle the ginormous GM heavy duty pickups. That part of the Fort Wayne plant was created back before pickup trucks became super-sized. GM had a fix for the problem involving $40 million in changes to the Fort Wayne assembly line to make it compatible with the trucks. Trucks are what drives the profits (or reduces losses) at GM so an investment like this is not out of the question. Other options were considered some of which would have meant that 3,300 GM employees would not be “retained.” In other words, people would be laid off. To look at alternative solutions a team was created. Elmer Tobe, Global Paint & Polymers Center resident engineer, was part of that team and in a recent press release from GM he is quoted as making the understatement “A lot was at stake.” After a six month study the team was able to come up with a solution that is now called the “Box Swap.” In order for it to work two trucks of the same color are used. One with an 8 foot box (truck-bed) and another with a 6 foot box. In essence, the paint booth is able to be used if a certain combination of cab and box is painted. The two largest combinations cannot be painted, so the box of a longer is swapped to the cab of a smaller, same-color, truck. This still cost GM $4million dollars, but the jobs were saved and the dollars spent are a lot less than the initial consideration of changing the entire plant paint area at a cost of $40 million. The failure of GM cost a lot of people money and a lot of workers their jobs, but GM re-emerged from the bankruptcy and is still using innovation to compete in a global market. Seems so obvious- like all brilliant ideas when seen in retrospect.